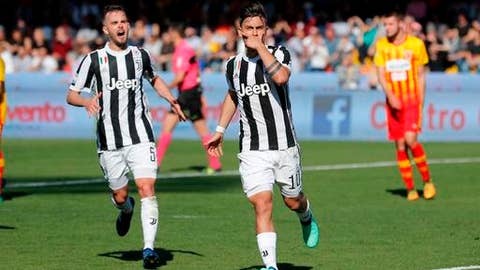 ROME (AP) Serie A leader Juventus overcame a series of defensive lapses to beat last-place Benevento 4-2 and move seven points clear on Saturday. Cheick Diabate scored twice for Benevento before Paulo Dybala converted the second of his two penalties in the 74th minute to finally put Juventus ahead for good and complete a hat trick. Coming off a debilitating 3-0 loss at home to Real Madrid in the Champions League quarterfinals, and ahead of next week’s second leg, Juventus coach Massimiliano Allegri rested several regular starters. The two goals Juventus conceded matched the number the Bianconeri allowed over their previous 17 Serie A games. Douglas Costa, another substitute, sealed the victory with a long-range goal in the 82nd. Dybala had two penalties saved earlier this season. ”Missing them happens. Goalkeepers train at stopping them,” Dybala said. Dybala was optimistic for Wednesday’s second leg in Madrid. Fiorentina won at Roma 2-0 for its fifth straight win – and sixth straight victory overall – since its captain Davide Astori died a month ago of a suspected cardiac arrest. Riccardo Saponara and Giovanni Simeone scored before halftime for the Viola. Edin Dzeko and Patrik Schick hit the crossbar for Roma amid a superb performance from Fiorentina goalkeeper Marco Sportiello. Third-place Roma remained only one point ahead of Inter Milan and two points ahead of Lazio, which each play Sunday. Napoli also hosts Chievo Verona. Fiorentina is seventh, one point below the Europa League spots. On Tuesday, Roma hosts Barcelona in the Champions League looking to overcome a 4-1 first-leg deficit. The Giallorossi then face Lazio in the Rome derby next weekend. Genoa goalkeeper Mattia Perin was the standout in a 0-0 draw with Sampdoria in the Genoa derby. Also, Atalanta equalized late with a penalty from Marten de Roon for a 1-1 draw at Spal, which had gone ahead with a header from Thiago Cionek.